It was not exactly a Rosie Ruiz, but when Lee DiPietro first ran Boston as a Boston University student some 20 years ago, she jumped in as a “bandit” for the last 10 miles. DiPietro, 46, from Ruxton, Md., will be among the top eight women’s master runners Monday, and hopes the weather won’t be so warm that she misses her goal of a sub-2:50. 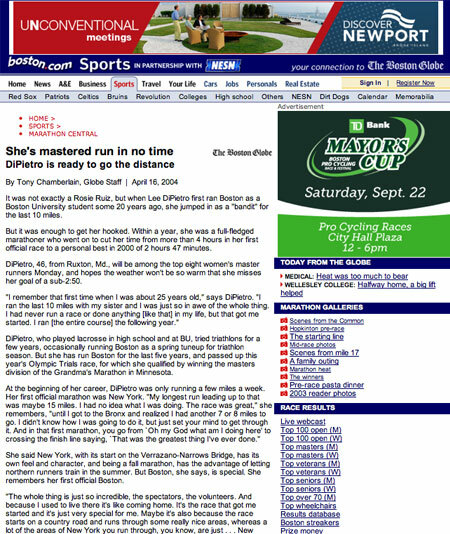 DiPietro, who played lacrosse in high school and at BU, tried triathlons for a few years, occasionally running Boston as a spring tuneup for triathlon season. But she has run Boston for the last five years, and passed up this year’s Olympic Trials race, for which she qualified by winning the masters division of the Grandma’s Marathon in Minnesota. DiPietro says she finds treadmill work so tedious that she often goes outside — over her husband’s objections — despite the snow and ice. And after the cold winter, and a very reluctant spring, the forecast of a near 80-degree day Monday is not exactly good news.